Virginia basketball replayed its last 12 months in about two hours Friday afternoon here in Columbia. The first hour, the ‘Hoos were getting dominated, again, by a 16 seed. “You can see the growth in that game alone,” junior guard Kyle Guy said Saturday, on the eve of UVA’s second-round NCAA Tournament game with Oklahoma. This time last spring, Guy was hiding behind sunglasses and hoodies on his way to and from classes on Grounds. The kid wears his heart on his sleeve, evidenced by that famous Facebook post in which he went into detail on how hard it was on him and his teammates to process the loss to UMBC. 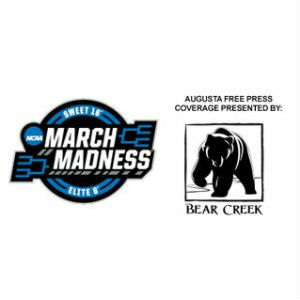 Augusta Free Press coverage of the 2019 postseason is presented by Bear Creek. Serving Waynesboro, Charlottesville, Harrisonburg and surrounding communities, Bear Creek provides a hassle-free process to help homeowners create outdoor living spaces that bring people together. Schedule a consultation at BearCreek.co. The Runnin’ Bulldogs led, twice, by 14 points in the first half, and had the Colonial Life Arena noisily on its side. The feeling in the arena was definitely similar to Charlotte a year ago. Importantly for the Virginia basketball program, the feeling on the bench and in the locker room was not similar to March 2018. “Last year, we panicked in that moment. This year, we didn’t,” Guy said, noting that the team hadn’t panicked all year, not when down big on the road at Louisville, down on the road in Chapel Hill. “We haven’t panicked all year, actually. Which is something I’ve never been a part of, because I’m a panicker when it comes to losing, because I hate losing,” Guy said. Guy is the one who has taken to saying of late, Calm is contagious. That was key Friday afternoon. “Last year, the players and the coaches freaked out. This year, it was nothing but positive thoughts, and just knowing that if we took care of our business, we’d be fine,” Guy said.